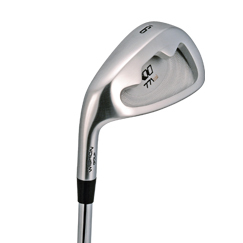 Made from 1020C carbon steel which produces a very soft feel unlike most large cavity back irons that are made of 431 stainless steel with a much harder feel. This model is designed with a head shape, size and profile that is very traditional. Also excellent if the player has a more extreme lie or loft fitting need. The 771CSI has a sole width of 18mm which puts more weight at the bottom of the head for higher flight. There is also sufficient offset in the neck of the club to help square the face at impact for golfers who normally fade their iron shots.